Get creative this holiday season and make some crafts out of your old gloves. 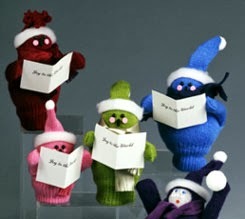 These adorable caroling gloves can be made using felt, sewing threads, pom poms and more. In eight easy steps they'll be ready for production. White cardstock, 1-3/4" x 2-3/4"
To make body, firmly twist together 1-1/2" foam-ball head and remaining foam shape; glue together with glue gun. Turn glove inside out. Refer to diagram to sew first and third fingers shut; trim seams to 1/8". Turn glove right side out. Fill thumb and little finger with small amount of fiberfil to create arms. Place foam body inside glove. Pull glove down until cuff is below bottom of body, and head is smooth. Note: Middle finger of glove becomes hat. Cut small oval mouth from craft foam; punch two holes from pink felt for cheeks. Use white glue to glue bead eyes, mouth, and cheeks to head. Glue white felt around head for hat cuff. Glue pom-pom to tip of hat. Note: To make hat shown on red caroler, omit pom-pom. Instead, tightly wrap sewing thread around hat close to head. Cut off tip of finger; make vertical cuts down finger to thread. Fabric will curl around itself to form pom-pom. Fringe ends of felt strip for scarf; tie around neck. Fold cardstock in half. Use marker to write, or computer to print, desired message on outside. Use glue gun to glue caroling book into hands.